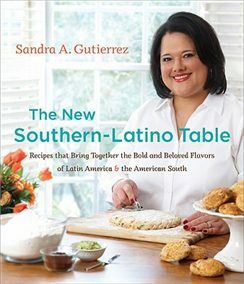 In this splendid cookbook, bicultural chef Sandra Gutierrez blends ingredients, traditions, and culinary techniques, creatively marrying the diverse and delicious cuisines of more than 20 Latin American countries with the beloved food of the American South. The New Southern-Latino Table features 150 original and delightfully tasty recipes that combine the best of both culinary cultures. Gutierrez, who has taught thousands of people how to cook, highlights the surprising affinities between the foodways of the Latin and Southern regions — including a wide variety of ethnic roots in each tradition and many shared basic ingredients — while embracing their flavorful contrasts and fascinating histories. Her lively dishes — including Jalapeño Deviled Eggs, Cocktail Chiles Rellenos with Latin Pimiento Cheese, Two-Corn Summer Salad, Latin Fried Chicken with Smoky Ketchup, Macaroni con Queso, and Chile Chocolate Brownies — promise to spark the imaginations and the meals of home cooks, seasoned or novice, and of food lovers everywhere. Along with delectable appetizers, salads, entrées, side dishes, and desserts, Gutierrez also provides a handy glossary, a section on how to navigate a Latin tienda, and a guide to ingredient sources. The New Southern-Latino Table brings to your home innovative, vibrant dishes that meld Latin American and Southern palates.